A fascinating museum of costume through the ages, from the 16th century through the present day. If it has anything to do with the history of fashion, you will find it here! 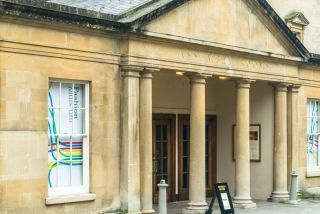 The Fashion Museum was founded by Doris Langley Moore, who donated her personal collection to the City of Bath in 1963. Originally known as the Museum of Costume, the Fashion Museum became the Fashion Museum in 2007 and is now three times its original size. The oldest objects are embroidered shirts and gloves dating to around 1600, but the collection also boasts items as up to date as a trouser ensemble made for Kate Moss in 2008. You can see displays of mens and womens wear, including dresses, coats, jackets, knitwear, pockets, fans, and waistcoats, to name but a few. There are special displays on Fashionable women, British fashion, and a 'Dress of the Year' exhibition. There is also an extensive array of photographs covering fashion through the years. The museum is located in the splendid 18th century Assembly Room building. Admission is free to the Assembly Rooms, but there is a charge to see the Fashion Museum. Editors Note: We have been to the Fashion Museum several times, both with and without children in tow. It truly is fascinating. On the last visit, we had trouble tearing our 8-year-old daughter away, she was so taken with the exhibits. This from a child who dislikes being dragged to museums! This former 17th century, stables conversion is situated in Bath, Somerset and can sleep two people in one bedroom.